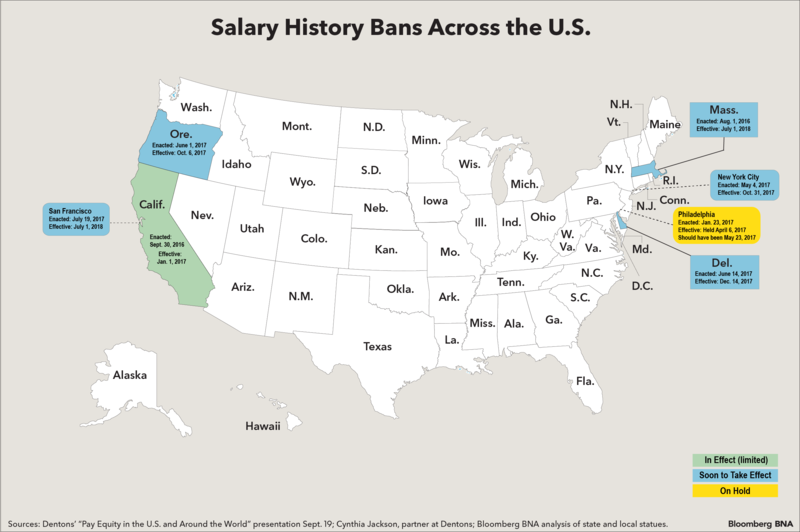 Can You Ask for Salary History in Your State? Your lawyer might agree with Miss Manners that you shouldn’t ask people how much money they make, especially if they’re job candidates. States and cities across the U.S. are banning employers from asking prospective staff about salary history, in an attempt to foster pay equity among men and women. But it may take time for the bans to be clearly defined. Inquiring about salary expectations may be the safer course. That’s exactly what Ryan S. Kunkel, a lawyer with Stoel Rives LLP in Oregon, says his firm has been advising clients to do. “Going forward, though, an interesting case could be made from the employee perspective is that even asking about salary expectations perpetuates implicit bias,” Kunkel said. Oregon will become the first state to ban inquiries into salary histories. The Beaver State’s law takes effect Oct. 6, but that’s only the first in a series of dates that enact different parts of the legislation. Employers that run afoul of the law can’t be sued until Jan. 1, 2019, and companies won’t face punitive damages until 2024. Enforcement in Oregon will be followed soon by Delaware, whose ban takes effect Dec. 14. A similar ban starts next summer in Massachusetts, where enforcement is set to begin July 1, 2018. California currently has a restriction that salary history “cannot, by itself, justify any disparity in compensation,” but it hasn’t completely banned inquiries about salary, yet. A California pay history ban passed the State Legislature and is waiting on Gov. Jerry Brown’s signature. Brown has until Oct. 15 to sign the bill. At the city level, San Francisco and New York City are awaiting their effective salary history inquiry ban dates of Oct. 31 and July, 1, 2018, respectively. Other cities, including New Orleans and Pittsburgh, have been enforcing for nearly a year narrowly tailored salary history inquiry measures, limited to the city hiring process, but haven’t enacted laws that apply to private employers.Philadelphia’s ban remains on hold pending a lawsuit brought by the Philadelphia Chamber of Commerce. What if Salary Is Part of Larger Database? Most of the salary history measures specifically prohibit an employer from inquiring about previous salary, but it remains unclear whether the different laws also restrict the use of databases containing salary history information. “Each investigation is different, but use of a database is one thing that our civil rights investigators could look at,” Charlie Burr, a spokesman for the Oregon Bureau of Labor and Industries, told Bloomberg BNA in an email Sept. 22. The state’s Technical Assistance for Employers Program, part of OBLI that works directly with Oregon businesses on workplace protections, “may recommend that employers not use databases to look up salary history in the interest of avoiding potential compliance issues in the first place,” Burr said. Jonathan Keselenko, a lawyer with Foley Hoag LLP in Massachusetts, said his state’s ban doesn’t address databases. That refinement will most likely be fleshed out by the state’s attorney general, Keselenko said. The Office of the Massachusetts Attorney General didn’t respond to a Bloomberg BNA request for comment. Cynthia Jackson, a partner at Dentons who has presented on the topic, told Bloomberg BNA Sept. 22 the use of databases would probably be seen as a violation of the law even if it’s not specifically mentioned. “If the employer uses a third party to do what it can’t do directly, I expect that will be prohibited as well,” Jackson said. Delaware’s statute, however, may address this. Most other statutes specifically prohibit asking for salary history. The safest method is to “really ignore an applicant’s salary history,” Kunkel said. If employers struggle placing applicants into salary categories without pay history, Kunkel suggests creating a range of salaries with different qualifications and matching an applicant to a particular compensation based on their qualifications alone. “If they can’t document that, they might have a legitimate problem and might need to look more deeply” into the way the company addresses pay equity, he said. Oregon and Massachusetts have both offered employees methods of defense in complying with the bans. Employers who conduct an internal analysis of their pay practices can use that as a defense to minimize potential damages or even liability. Oregon employers can mitigate compensatory and punitive damages if they’ve conducted an equal pay analysis. And in Massachusetts, companies can limit their liability if they’ve conduced a self-evaluation. Keselenko said Massachusetts’ affirmative defense is a great option for employers.